It is possible to flash the development board via the CANbus or via an USB connection. 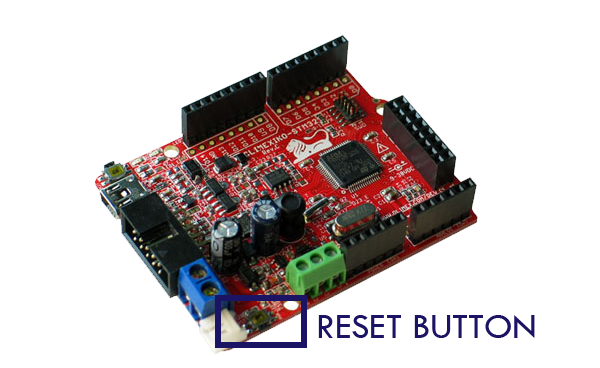 This section only describes how to flash the development board using USB. The board is connected to the PC’s USB port. Power is supplied to the Olimexino board. When the development board is plugged in to the computer for the first time it is necessary to install the driver of the bootloader. To install the driver the program should be kept in bootloader mode. For the Olimexino this is achieved by pulling D2 down to ground with at least a 150 Ohm resistor(max 820 Ohm), while resetting the microcontroller using the RESET-button. For the E407 and the P405 press and hold the button while pressing and releasing the reset button. The first time the USB is activated on a different PC, Window’s will ask you to install the USB driver. The driver can be found here. Before installing the USB driver, make sure the USB device that runs the OpenBLT USB bootloader is not connected to your PC. If a prior version of the USB driver was installed, it is recommended to first uninstall this driver. The installation of the USB driver is performed using the Zadig tool. 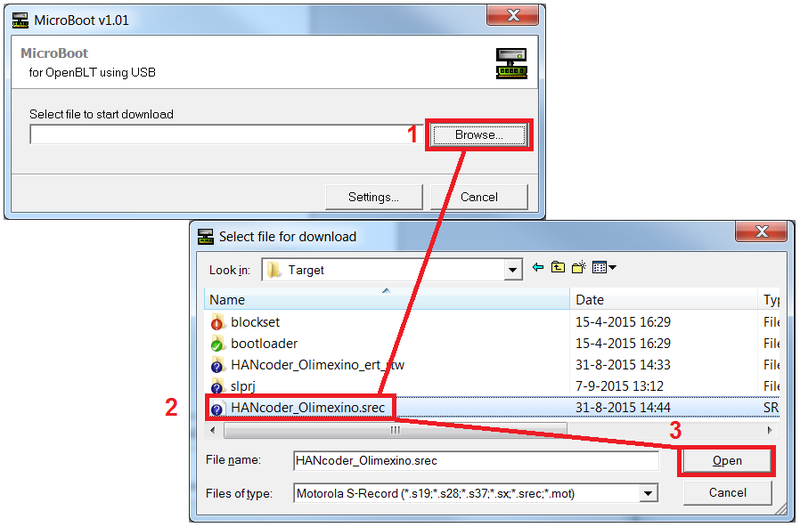 You can download the necessary files here: OpenBLT USB Driver Package. After downloading the OpenBLT USB Driver Package, unzip the archive to a location of your liking and start the program zadig_2.2.exe. After building the template model the microboot utility should already have automatically been started and when the driver installation was successful the newly made Simulink software should have already been flashed onto the development board. The LED should be blinking and should blink faster when the button is pressed. If the development board needs to be flashed manually start the MicroBoot utility. It can be found in ‘\Host\MicroBoot\MicroBoot.exe’. Click the Settings-button and select ‘OpenBLT using USB’, and click the OK-button to save the settings. 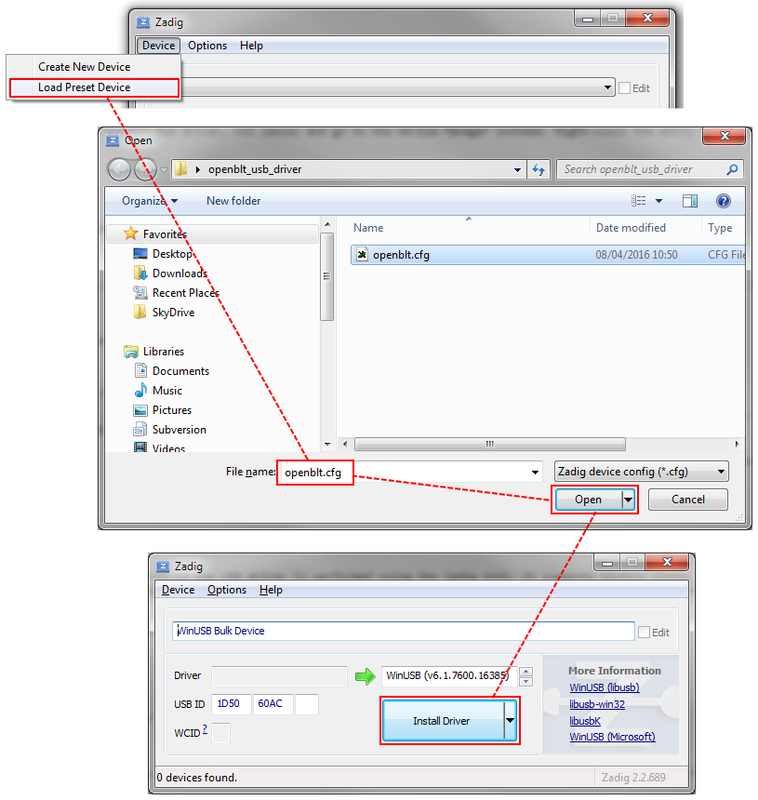 Next, click the Browse-button to select the .srec file (Motorola S-Record file) of the software program. The one from the demo model is located at ‘\Target\HANcoder_Olimexino.srec’. Once selected, the Simulink software is flashed onto the board. Its progress is shown in the main screen. Upon completion, the newly flashed software program is automatically started.